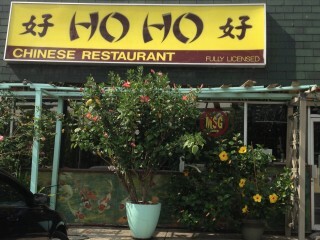 When my sons were younger, Ho Ho was our neighbourhood go-to for Chinese food and sword fighting. Affable owner Tony Ho, after delivering a round of fortune cookies, would blow up balloons, twist them into Excalibur shapes, and invite the boys to go whack each other in the empty dining room he used for overflow. Ken and I would then finish our Tsingtaos and pick over the leftovers in some measure of peace, soothed by the soundtrack of spirited duelling from the next room. 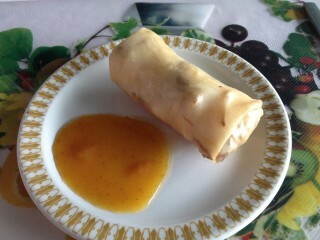 Spring rolls are crisp, soft, and yummy, filled with whole shrimp, pork, black mushrooms, bean sprouts, and shredded veg. My sons duke it out differently now, and I don’t think I’ve been back to Ho Ho’s in 10 years. But the familiar riot of colour drew me in last week. That, and a sudden longing for one of their pudgy spring rolls. Ho Ho’s giant potted hibiscus have done well this summer. The plants nearly obscure the 20-year-old NO MSG sign in the window. Tony remains a fun and kind fellow and the spring rolls are just as satisfying, just as fat and filled, the wrapper just-greasy enough, the contents — whole shrimp, tender pork, black mushrooms, bean sprouts, and shredded vegetables — crisp, soft and yummy. Unlike the rolls themselves, the plum sauce is pedestrian. Lunch specials are priced at $8.95. On this day, the offerings included a Szechwan pork stir fry with mustard greens. There were three lunch specials on my day, each priced at $8.95. 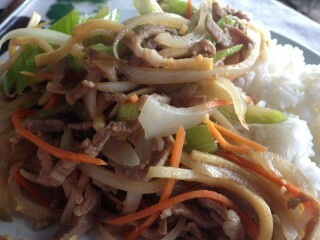 I had the Szechwan pork with mustard green stir fry, served with rice. It featured more celery than bitter greens, but the pork was soft and moist, the vegetables had good crunch, and though the heat suggested in the Szechwan title was served in muted form, it was a satisfying enough lunch, with leftovers for the fridge. Consumed as a midnight snack by a former Ho Ho swordsman. Ho-Ho, 875 Richmond Rd., 613-722-9200, hohochinesefood.com.